July 14, 2005, C Coughlin & L Crabo. 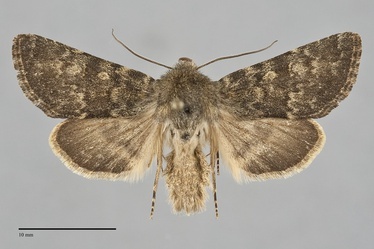 Lasionycta silacea is a mottled olive-gray and ochre medium-sized noctuid moth (FW length 14 - 18 mm) that flies near timberline in Washington and British Columbia. The forewing is dark olive with scattered ochre scales and filling of the lines and spots. The most prominent markings except in light individuals are the pale portions of the antemedial and postmedial lines, the light subterminal line, and the incompletely filled orbicular and reniform spots. In light individuals the dark olive-gray lines are more evident. The antemedial line is mildly irregular and the postmedial line is strongly dentate. A dark median line is usually faint. The orbicular spot is small and contains a central ocellus of the ground color. The reniform spot is usually a patch of ochre scales with a central dark bar. The fringe is checkered with olive-gray and ochre. The hindwing is ochre-gray with darker smoky suffusion toward the margin, faint discal spot and postmedial line, and a light ochre fringe. The ventral hindwing is light ochre-brown with a small discal spot and gray marginal band. The head and thorax are olive-gray. The male antenna is strongly biserrate. This species is unlikely to be confused with other species in Washinton. 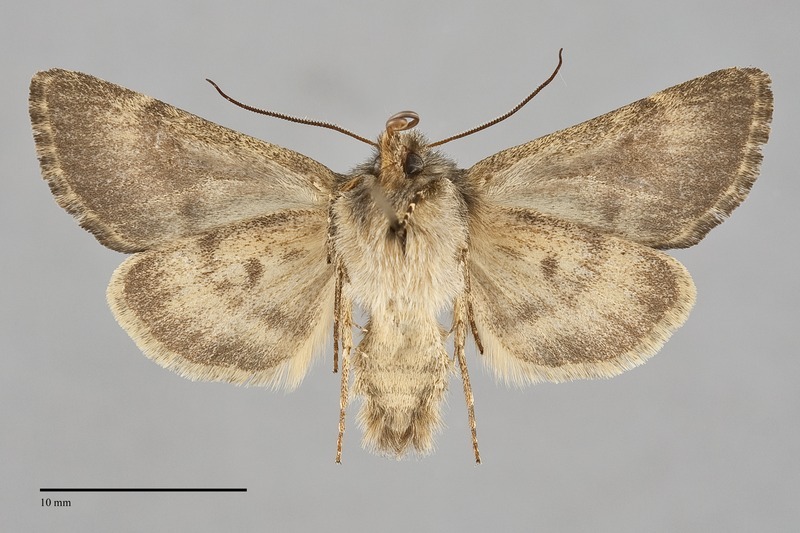 In British Columbia it flies with Lasionycta promulsa, a gray-brown species that is similar in size. It lacks an ocellus in the orbicular spot, has a gray-brown ventral hindwing without a yellow tint, and the ventral hindwing discal spot is smaller than in L. silacea. The type locality of Lasionycta silacea Crabo and Lafontaine is Canada, British Columbia, Blowdown Pass near Gott Peak, [50° 21' N 122° 08'], 7100'. This species is narrowly endemic to high elevations in the northern Cascades and Rocky Mountain region in subalpine spruce-fir forests or subalpine meadows close to timberline. It is often common in this restricted habitat. Lasionycta silacea has a fairly small range that is nearly limited to the Pacific Northwest. It occurs in the mountains near the Pacific Coast from the southern Cascade Range in Washington to the British Columbia Coast Range near Kleena Kleene west of Williams Lake. The range extends east just north of the Canada-United States border to extreme southwestern Alberta. This species is only known from the vicinity of Waterton Provincial Park in southwestern Alberta outside of the Pacific Northwest. No information is presently available regarding larval foodplants of this species. This species is single-brooded and flies during the summer. The collection records are from July and August. It is nocturnal and comes to lights.